One of the best things about a new graphics card launch is that the current ones get massive price cuts prior to their competitors arrival. While AMD officially released a statement that they won’t offer or change the pricing structure of their Radeon graphics cards, retailers have now started offering their own price cuts on the Radeon R9 290X graphics card with the prices being slashed down to as low as $449 US from its original MSRP of $549 as reported by TechpowerUp. Going over at Xbitlabs reveal that AMD actually made a statement that they have no plans to consider the price model that currently exists for the Radeon graphics cards. What AMD doesn’t know that the pricing has already been slashed on various cards over the last two months and prior to the launch of their Tonga based Radeon R9 285 graphics card. AMD even goes to state that their Radeon R9 295X2 will stick to the $1499 US range while it has been adjusted to $999 US in several markets and that was officially confirmed by AMD. AMD also seems to have forgotten about the Radeon R9 280 (Tahiti Pro) which was launched at $249 but now is officially targeted at $229 US while its spot is taken over by the Radeon R9 285. Similarly, the Radeon R9 280X has been slashed down to $279 US and will make way for the Radeon R9 285X (Tonga XT) at $299 US. All of these little and huge price bumps have happened over the last two months which suggest something is going on over at team red. One possibility, which seems to be most likely is that NVIDIA is going to introduce their GeForce Maxwell based cards during the next couple of weeks. Starting with the $499 US GeForce GTX 980, the lineup will include the $349 US GeForce GTX 970 and $299 US GeForce GTX 960. 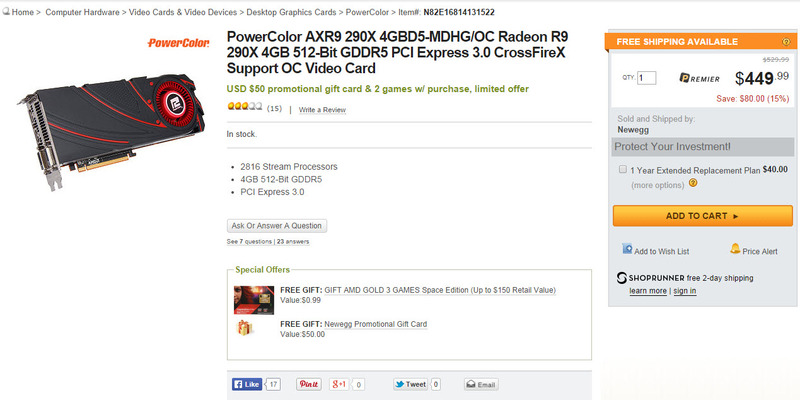 From what we know, AMD has nothing to compete against these cards till Q4 2014 / Q1 2015. So price cuts now make sense for the company. The most biggest price cut is for the Radeon R9 290X which is slashed by $100 US since it is going against the GeForce GTX 980. The GeForce GTX 980 has already been said to be faster than the GeForce GTX 780 Ti and the Radeon R9 290X does end up slightly lower in terms of performance compared to the GTX 780 Ti. The GeForce GTX 980 retails at $499 US which takes away the point of buying a card slower and expensive then its competition. I think of it as a similar situation which happened at the time of Kepler’s launch. The AMD Radeon HD 7970 was available at $549 US when NVIDIA launched their GeForce GTX 680 for $499 US two months later. AMD slashed the pricing of the HD 7970 to $449 US not only making it competitive against the GTX 680 but also launching a second variant of the Tahiti XT core which was fused on the AMD Radeon HD 7970 GHz edition featuring better clock speeds. Now there have been rumors of a faster Hawaii card in the past and I believe that most of it was just a speculation by forum members but if that turns out true, then its brings us to our second possible scenario where AMD could launch a faster Hawaii variant for $549 US featuring their new and improved Hydra cooler which we saw yesterday. Either that or a new series of cards which will totally exclude the first gen GCN cards and consist of only new chips.